The Boaz Vaadia Museum Collection is comprised of the final piece of the edition of nearly every bronze cast of Vaadia's figurative sculptures. The purpose of this is to assemble one of each of Vaadia's bronzes in a single collection located in one place. The work from this collection is available for loan to museum exhibitions or to public installations. Curators of such shows have the opportunity to select from an entire body of work to custom tailor their show in a way that responds to each space's individual characteristics. This flexibility extends even to traveling shows. Often a traveling exhibition is composed of a stable and unchanging body of work that is selected for one particular exhibition space. When the show travels to other spaces, the pieces selected for the first destination remain for installation in the following exhibition locations. The Boaz Vaadia Museum Collection is intended to allow for specific spatial conditions of each particular exhibition space. Curators are able to revise or amend the traveling selection of works so that the installation is specific to the site. The relationship between man and man's place in nature plays a primary role in Vaadia's work and it is this consideration for relationship that drives the concept of the Museum Collection. 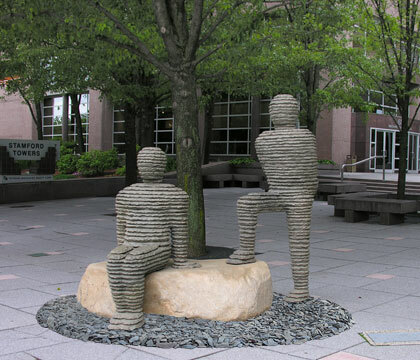 It is important that the sculptures are placed thoughtfully within an environment to allow for an intimate and personal connection between the work and the viewer. SPECIAL NOTE: Certain stone pieces from Boaz Vaadia's personal collection may also be made available for select museum exhibitions.